We are back in London after a rather long holiday in India. This week has been busy as we have had a lot of things to clear out and also do all the unpacking. We are almost done and slowly this change is starting to feel more normal. I even managed to whip up some dosa batter in between all the de-cluttering. Last night I was the tired mother who was sipping on a glass of Merlot and also trying to make dosas for the half pint who was happily sat on the kitchen counter to see his mum in action. Somehow, those few moments I shared with him while I served him and watched him eat made me feel oh so nostalgic. I was the little child in my mother’s kitchen who always sat on the counter and enjoyed having food off the stove while mom and I spoke random things. Yesterday, I saw myself sharing a slice of my childhood with Neil while he enjoyed his dinner just like the way I used to. This whole scene from last night made me feel something that pretty much sums up life for me. All I want to do is cook for the family with a bottle of wine perhaps…. It may only be appropriate to share one of my favourite recipes while I am talking about how much I love to cook. 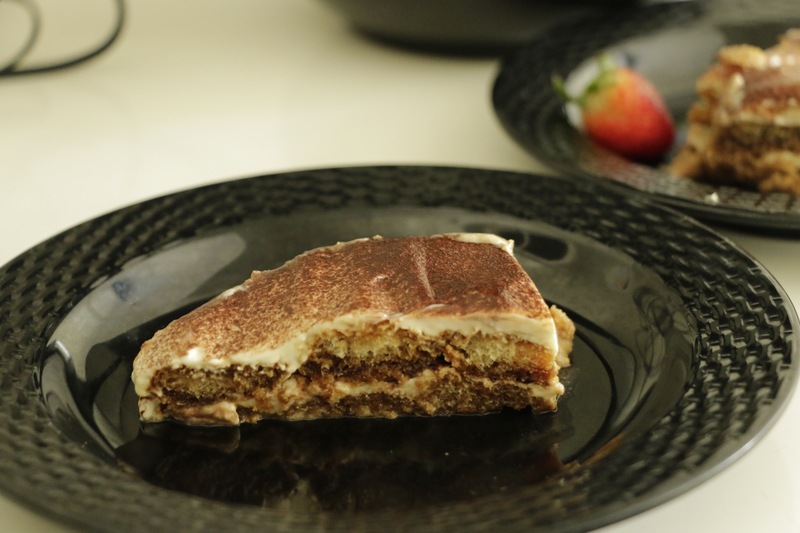 The recipe is only a matter of getting things in order and layering them up to form a Tiramisu. This is a non-alcoholic version only because I find the existing amount of coffee and cocoa is enough for me to go bonkers. So feel free to add a bit of rum to your coffee decoction if you are more grown-up than I am. This is the dish I like to use so it is easy to build a neat layer. The wider the better! First prepare the coffee like you would normally do. ( enough to soak the finger sponges , I usually fill a pasta plate) pour into a bowl and let it cool. Whip the egg yolks with half the sugar to obtain a very light and creamy mixture. Whip the egg whites with a pinch of salt, add the sugar (the remaining half), with a wooden spoon, add them gradually and gently into the mixture of mascarpone and egg yolks, so you now have the cream for the tiramisu. Soak the sponge fingers one by one in the coffee and start to build your layers. Cover the fingersponge soaked with a layer of mascarpone cream adjusting with a spoon. Sprinkle the surface with cocoa powder. Go ahead with the second layer of fingersponge, cream and cocoa. Also, if before you have them arranged vertically, then place them horizontally (and vice-versa). Complete with plenty of cocoa powder to cover the surface of your Tiramisu and Store in refrigerator for a few hours before serving.